Keeping your website software up to date is probably the single most important step for a secure website. Out of date software can make it easier for hackers to find ways to break into your website. For more information, see Software Maintenance & Website Security. There was 1 WordPress release in August. There was 1 Joomla release in August. This is a bug fix release addressing a single bug that prevents new installations of Joomla! 3.7.4 with remote databases. SECURITY RELEASE means that security vulnerabilities have been found in the software and will be fixed by this release. To protect your site from hackers and malware, you should update to this release as soon as possible. There were no WordPress releases in July. Updated/new widgets for: Image, Video, Audio, Rich Text which simplify the process of adding and maintaining. Link Boundries – improved creation and handling of links in posts and pages. Nearby WordPress Events – is a new item added to the Dashboard to inform WordPress admins of WordPress events around their area. There were no Joomla releases in June. This release fixes some bugs in file mime checks, module page filtering as well as some other bugs and several other minor improvements. Insufficient redirect validation in the HTTP class. Improper handling of post meta data values in the XML-RPC API. Lack of capability checks for post meta data in the XML-RPC API. A Cross Site Request Forgery (CSRF) vulnerability was discovered in the filesystem credentials dialog. A cross-site scripting (XSS) vulnerability was discovered when attempting to upload very large files. A cross-site scripting (XSS) vulnerability was discovered related to the Customizer. This release address a critical security issue as well as several bugs. This release contains 47 maintenance fixes and enhancements, chief among them an incompatibility between the upcoming Chrome version and the visual editor, inconsistencies in media handling, and further improvements to the REST API. Over 700 improvements, including many features which make administration of Joomla! Web sites easier and more feature-rich. This release contains 39 maintenance fixes to the 4.7 release series. There were no Joomla releases in March. There were no WordPress releases in February. There were no Joomla releases in February. There were 2 security releases in January. By default, a security release will be applied automatically if you are on WordPress 3.7 or higher. There were no Joomla releases in January. Strong passwords are key to keeping our online personal information and all types of sensitive data secure. A strong password is also important for keeping your own website, be it WordPress or Joomla, secure and safe from hacker intrusions. We are required to have an ever-growing number of passwords for an ever-growing number of websites, apps, services, etc. One option is to use one easy to remember password for everything. The problem with that approach is hackers are on to that one. They will automatically try the same login information on multiple sites to see if it works. They will also try every common password known to man. I’m sure you’ve seen the multiple lists of terrible passwords to avoid at all costs. 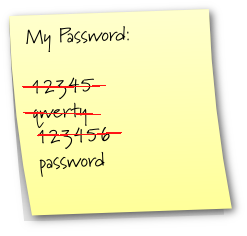 The best passwords are the ones you cannot possibly guess… or even remember. They should be long, the longer the better. If a site has a maximum password length, use it. They should be complex, containing a mixture of upper and lower case letters, symbols and numbers. They should be different for every site you access. So how can we possibly manage all these secure, unmemorizable passwords? Just need help with the whole website thing?